While the debut of AT&T's 4G LTE networks coincides with the launch of a new iPhone, which is AT&T's most popular smartphone, the press releases issued by the carrier make no mention of Apple's iPhone 5. Instead, AT&T has focused on promoting some of its other 4G LTE capable devices: the Motorola Atrix HD, Sony Xperia ion, HTC One X, Samsung Focus 2, Nokia Lumia 900, Samsung Galaxy Note, and Pantech Element tablet. 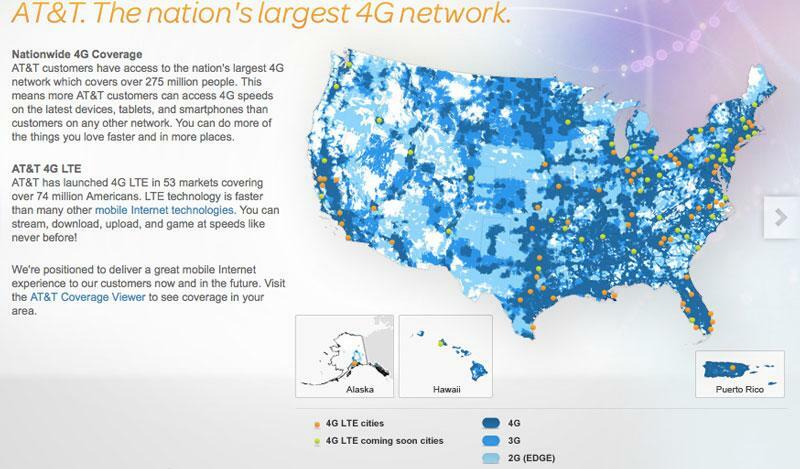 The addition of 10 new markets comes only a few weeks after AT&T turned on its 4G LTE network in nine other markets. The carrier has promised that 34 more will gain 4G LTE coverage before the end of the year, including Denver-Boulder, Colo.; Albany, N.Y.; Detroit, Mich.; and El Paso, Tex. Current iPhone 4S owners on the AT&T network will see their signal advertised as "4G" in many markets. AT&T began advertising its HSDPA network as 4G because it is capable of 4G-like speeds, though it is not a true fourth-generation network. Apple has addressed this distinction by displaying an LTE symbol in the upper left corner of the iPhone 5 and third-generation iPad when the devices have a true 4G LTE signal.